This could make the difference between a simple repair and having to buy new parts. Repeatedly opening the screen can damage the screen hinges or even more. It can also cause cracks to spread into the top cover and even the LCD screen. Big money! If this happens to you, we can certainly help. We’ve done hundreds of these repairs. Visit our Tucson Laptop Repair website to find out more about what we can do for you. Prevention is Key! Here’s some guidelines to prevent damaging your laptop screen hinges. Use both hands when opening your screen. If you do have to use one hand, make sure you place your hand in the MIDDLE of the screen. If you obey this one simple rule, your screen hinges and screen support assembly will last much longer. you grab your laptop and flip open the screen with one hand, you are flexing your screen in ways that it was not meant to be. 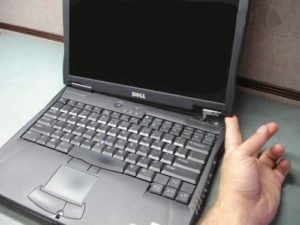 Some laptops have a latch on the screen lid. If yours does, be sure the latch on the front is released BEFORE you try and open your screen. It is very easy to bend your screen housing, or worse, break your MacBook Pro screen or screen hinges. Keep your laptop away from the edge! The edge of the table, the edge of the seat of your car, the edge of your desk…you get the idea. It’s just another simple rule that can save you hundreds of dollars in repairs or parts replacement. Most hinge and screen frame damage is caused by drops – many of which could have been avoided if we all simply keep our MacBook Pro away from the edge of whatever we set it on. If you carry your laptop around a lot, get yourself a “sleeve” made of silicon, leather or other material that will help keep your laptop from slipping out of your butter fingers. Yeah, like we’ve never dropped our laptop before. Trust us. You want a sleeve. These are more common for MacBooks, but you may be able to find one for other brands on eBay or Amazon. Get a good carrying case – one with a decent suspension. And no, we’re not talking about your cars suspension. Get a case with a back that has a suspended inner section for your MacBook Pro if possible. This will keep your laptop from coming into contact with the ground, since we know you like to toss your bag around at the end of the day.